New Puppy? Geriatric cat? Birds? They can all leave their mark... a mark that you smell whenever you walk in the door of your home. Even if you can't smell it, there is a good chance your guests can. A recent TV ad campaign coined the phrase "nose blind". Have you gone nose blind? No one likes a smelly carpet. Whether the odor is coming from an old food stain or, more likely, a pet who decided to leave their mark inside rather than outside, the smell is obnoxious. Be sure you choose the odor removal experts - OxyMagic. Our odor removing process will eliminate mild to moderate smells with ease. 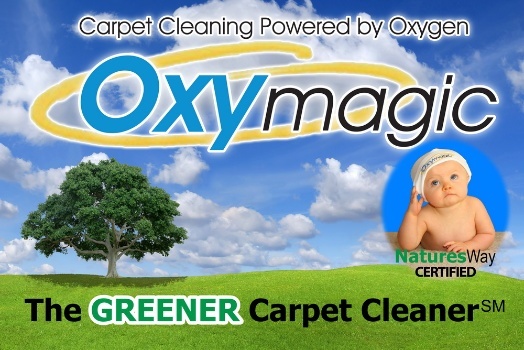 If you’re experiencing a severe odor that cannot be effectively removed by our normal cleaning process, OxyMagic also offers a high performance product that can remove odor like nothing else: Nature's Way Bio-Zyme. Nature's Way contains a live bio-enzyme specifically designed to eliminate odor causing bacteria in your carpet, making it the perfect pet odor removal product. OxyMagic technicians use this powerful odor remover throughout the entire room - not just on bad spots - in order to get rid of any bacteria or stains that may have begun to spread. Our goal is to get the stains and smells you can see AND the ones you can't see. After a carpet cleaning, some people get very paranoid about stains. They see their young daughter or son toddling around with some juice as a stain waiting to happen, or the dog as a ticking time-bomb of soiled carpet. Thankfully, Oxymagic has a carpet protector designed to relieve those worries. Oxymagic's safe and effective Carpet Shield Protectant was created to keep stains and spills from setting into the carpet, giving you the time you need to clean them up. This temporary carpet protection will help keep your carpet safe for up to six months, and if a stain does develop, the carpet stain protector will greatly aid in the stain’s removal the next time you get your carpets cleaned. With Carpet Shield Protectant, you can relax after your Oxymagic cleaning.